We used to know how to know. We got our answers from books or experts. We'd nail down the facts and move on. But in the Internet age, knowledge has moved onto networks. There's more knowledge than ever, of course, but it's different. Topics have no boundaries, and nobody agrees on anything. Yet this is the greatest time in history to be a knowledge seeker ...if you know how. 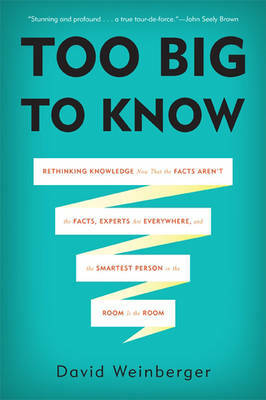 In Too Big to Know, Internet philosopher David Weinberger shows how business, science, education, and the government are learning to use networked knowledge to understand more than ever and to make smarter decisions than they could when they had to rely on mere books and experts. This groundbreaking book shakes the foundations of our concept of knowledge--from the role of facts to the value of books and the authority of experts--providing a compelling vision of the future of knowledge in a connected world.